West Moors woman Meg Austin has scooped the national Dignity in Care Award at the Great British Care Awards just months after being crowned 2016 Care Personality of the Year. 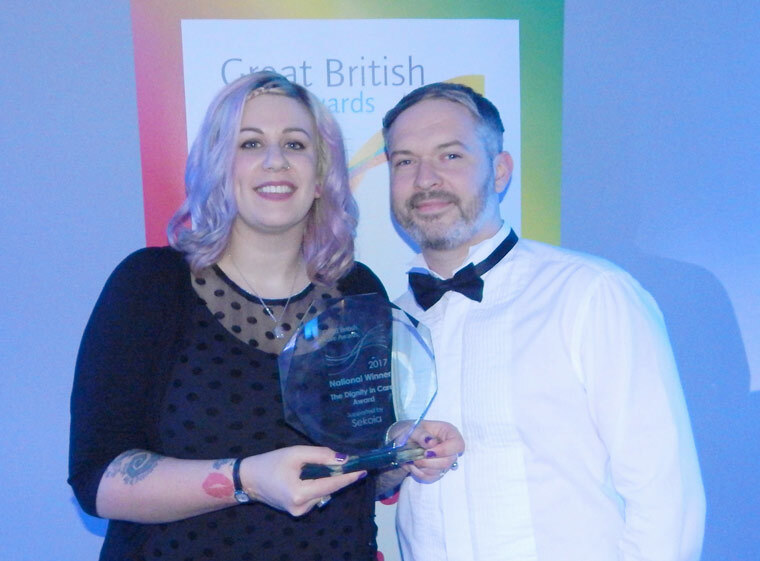 Meg Austin, a Healthcare Assistant at The Aldbury in Parkstone, Poole, became a champion of dignity in care at the Great British Care Awards. Working at the family-owned Dorset dementia home, the accolade is Meg’s second national award in successive years. It follows a separate title of Care Personality of the Year at the 2016 National Dementia Care Awards. Nominated by colleagues at Colten Care and residents’ relatives, she was presented with her Dignity in Care award by actor and musician Martin Kemp at a gala ceremony at Birmingham’s ICC attended by 900 fellow care professionals from across Britain. The award criteria were to ‘demonstrate the significance of maximising client independence and choice, while respecting and maintaining privacy and dignity at all times’. In their citation, judges praised Meg’s work on several initiatives she has led or been involved with at The Aldbury. They include a multicultural day held every other month designed to celebrate the diversity of staff. In the most recent event, residents enjoyed a ‘Thai something new’ day featuring music and food with team members from Thailand. A Romanian-themed day is also being planned. Meg was also complimented for helping to organise a staff ‘dignity focus group’ and a wish tree where families can suggest days out and other experiences for their loved ones at the home. Among the wishes granted so far have been a drive in an open-top BMW car and a ride on the Bournemouth Balloon. The judges wrote: Meg proves to be a true champion of dignity and an inspiration to the lives she touches. Meg started at The Aldbury as a carer in 2010 and has expanded her responsibilities with team leading, training and a one-to-one resident companion role. With Colten Care’s support, she is now in the final year of a Southampton University degree combining general and mental health nursing.